Sandwiched on a narrow strip of land between the Andes Mountains to the east and the Pacific Ocean to the west, Chile is a unique and awe-inspiring country. Stretching over 2,600 miles but only 217 miles at its widest point, Chile encompasses a remarkable variety of landscapes, climate and wonders. While vast swathes of this country may seem inhospitable due to the climatic extremes which it crosses, it is however well engineered for tourism enabling the country to welcome visitors from all over the world whereby they can sample the history, culture and get to see some of the most wondrous sights known to man is a country that is as unique as it looks. If you would like to know more about Travelbag’s excellent tailor-made holidays to Chile, don’t hesitate to contact us on 0207 001 5864 and speak with one of our friendly and knowledgeable travel experts. Chile’s unique geography provides reason enough to visit this marvellous country whereby the friendly population make you feel welcome while the country’s infrastructure provides excellent touristic means in which to travel the length and breadth of this fascinating strip of land tagged onto the South American continent. Nearly every South American landscape is encased in this 2,600-plus mile long cartouche-like country. Incorporating the driest place on Earth known as the Atacama Desert in the northern region of the country to the millennia old glaciers of the Patagonia region in the south, Chile provides a truly memorable adventure. Witness everything by travelling from Puerto Williams in the south in the Tierra del Fuego archipelago to Arica in the north and behold the sparse deserts, salt flats, vineyards, vibrant cities, volcanic eruptions, mountain ranges, diverse fauna, wildlife and enormous glaciers. Chile is truly a unique opportunity to experience South American treasures all rolled into a thin strip of land that will leave you inspired. Travelling the length of Chile and witnessing diversity unlike anything else on Earth. Natural wonders such as the mountains of the Andes and the glaciers of the Patagonia region. Witness Earth’s driest region in the Atacama Desert. 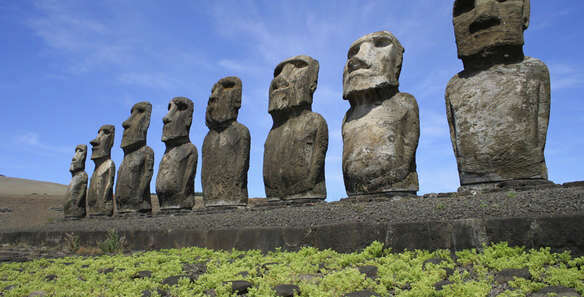 Ancient ruins including the mystifying statues of Easter Island. Bustling cities filled with life such as the capital Santiago. If you would like to know more about Travelbag’s excellent tailor-made holidays to Chile, don’t hesitate to contact us on 0203 139 7074 and speak with one of our friendly and knowledgeable travel experts.